When you have been injured due to the negligence of another person in a car accident, slip and fall accident or any other circumstance, there are a few critical things you need to remember to do in order to protect your physical health, economic situation and legal rights. The three most important steps are to immediately seek medical treatment, exercise your right to remain silent, and consult with a personal injury lawyer to represent you in your insurance claim and any legal proceedings. Getting immediate medical treatment should be the first order of business when you are injured in an accident. This might seem obvious when you have external injuries like broken bones, lacerations or have been rendered unconscious. It's not as obvious however in situations where your injuries are internal and do not manifest themselves with symptoms immediately after the accident. Many people are so relieved to not be seriously injured that they tend to convince themselves that they are well and consequently, they fail to seek medical treatment. In reality, neck injuries like whiplash and back injuries that can become permanently debilitating, may not be apparent for days or even weeks after your accident. No matter how insignificant your accident may appear, be it a motor vehicle accident, a slip and fall or other mishap, always seek immediate medical attention. The second point you absolutely need to remember is that you must remain silent. Although law enforcement including the OPP or municipal police will likely not remind you of this right, they will admit, if asked, that anything that you say can be used against you in court. Therefore, do not say anything at all because "it may be used against you" in establishing your settlement or even result in charges being laid against you. In addition, you are under no obligation to speak with anyone else who is at the scene of the accident. Store managers and automobile insurance representatives are motivated to get to the scene of the potential lawsuit immediately and to get you to make an incriminating statement. All you should say is that you need to get to a hospital immediately and that they need to refer any questions to your personal injury lawyer. You and your family will be best served by consulting with a Personal Injury Lawyers of Ontario (ILO) attorney as soon as possible. If your injuries are the result of the negligence of another driver, premises owner or other person or entity, you likely have a case to recover the financial damages you are now experiencing or may suffer in the future. In addition to your pain and suffering, you may be faced with mounting medical bills and may be unable to return to work. For accident victims, a claim to recover compensation for damages only has an 'up' side, and there is no reason to settle for anything less than the best and most experienced legal representative. If you or a family member have been injured as a result of the negligence of another person in any way, you'll need a lawyer you can trust to guide you during the critical first few days following your accident. What you say and do will impact the financial relief that you may obtain. 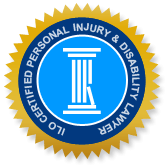 By calling an attorney from Injury Lawyers of Ontario (ILO), you can be confident that you have a exceptional team of experienced injury lawyers behind you. Our member firms have practices that are dedicated to personal injury and disability law. Use the form on our website or pick up the phone to contact us to learn how we can help with your situation.